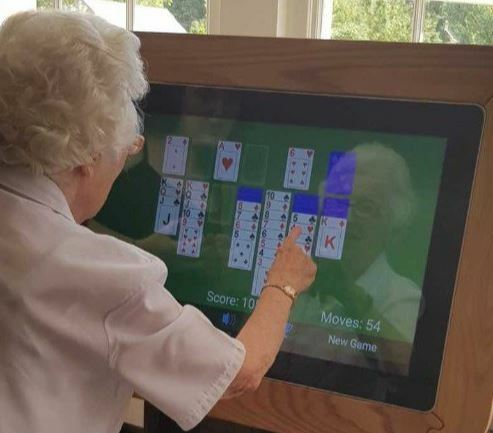 Nazareth Lodge is pleased to announce the arrival of its new Interactive Activity Touch Table with RemindMecare Software. This technology is being used to enhance daily activity sessions and to enable our residents to access the internet, use Skype and Facetime to communicate with friends and relatives, and of course to play games and relax. The table is on wheels which means residents can access it as part of a group activity or it can be moved to their private rooms so that they have privacy when talking to friends and family. Our staff have been trained so that the can assist residents and ensure that everyone gets an opportunity to use this new technology. The Interactive Table is a fully integrated/ portable/ adjustable interactive touch table which is simply used in the same way as a smartphone or Ipad. Providing CQC, DQM & Care Inspectorate compliant software, ideal for improving the well-being of residents.